Left riser = 1.25 quarts in 15 seconds. Right riser = 2 quarts in 15 seconds. I attached a photo of each riser for your reference. I pulled the hose coming in horizontally to the riser. There is a different hose connected to the bottom of the manifold. Leave that hose alone, correct? I also attached a picture of what I think is the transom water inlet hose (red hose). Nice thing is there is a quick disconnect. I am now supposed to pull that off and inspect for blockage/narrowing, correct? I am sorry to hear you are having these problems with your Merrcruiser. I know that can be frustrating. Hopefully, we can get you back on the water quickly. Your question was - I am now supposed to pull that off and inspect for blockage/narrowing, correct? I will be happy to help you with that. 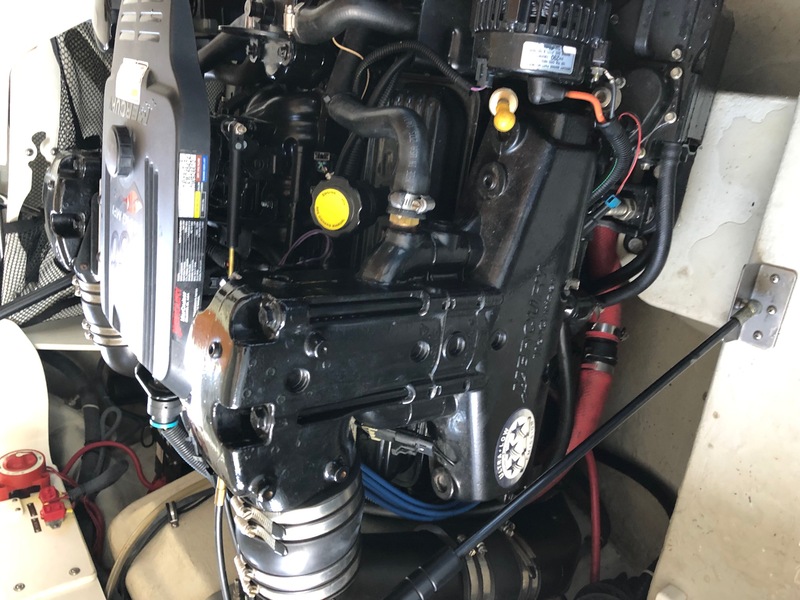 what you would need to do next is disconnect the water inlet hose from the top of the inner transom plate. 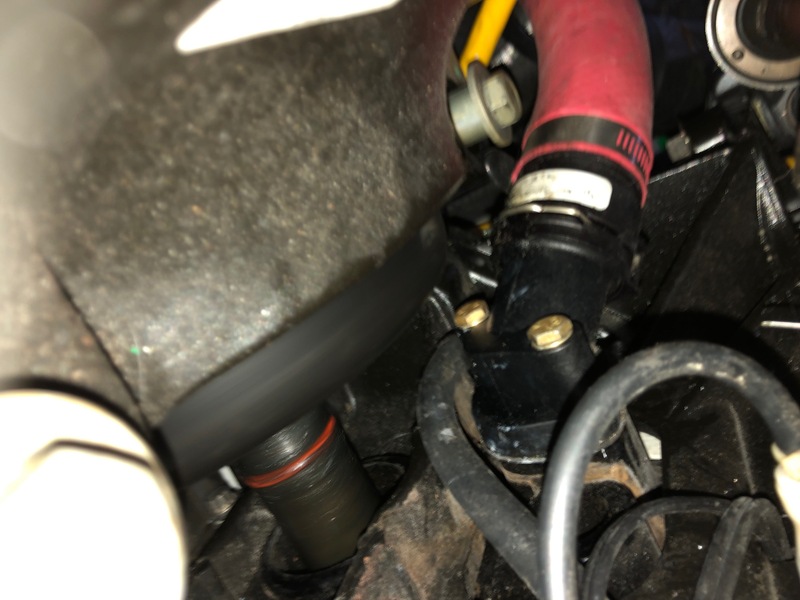 Then remove the little neck fitting that the water inlet hose connects to. Then, once the neck is off, look down inside the transom water line, and see if that looks like it's pinched off or not. Jason, thanks for the quick reply and for confirming. That hose connection is in a really tight place next to the engine so I just ordered a small Wifi endoscope camera I can push into the transom inlet hose for a view. I don't expect to find corrosion as this is a fresh water boat. Am I wrong? How will I be able to identify if the hose is collapsing when suction is applied by the seawater pump? Well, you technically could rig up a vacuum gauge on the inlet side of the seawater pump it could be done that way. If the hose is collapsed, the gauge would read very high vacuum. In the shop we would pull the drive and bell housing off and have a look at it. I am attaching a picture. 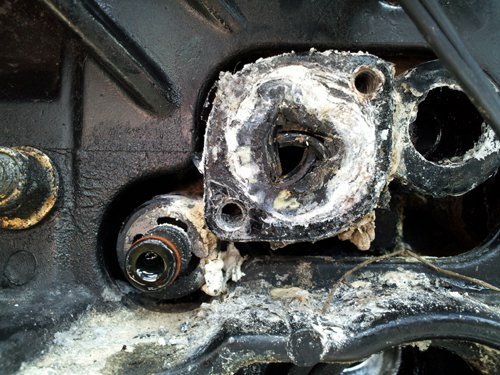 In the picture you will see all sorts of white corrosion. What you are looking at is a failed water inlet hose. That hose should be roughly 1 1/2 inches in diameter. As you can see in the picture, it's not even close. Thanks for the idea and picture. Very helpful. One related bit of detail I may not have shared. When the engine is at idle (700 rpm) the temperature will rise to 185 degrees in about 20 minutes. When I increase the engine rpm in neutral to 1200 rpm the temperature drops instantly. Literally in 15 seconds the temp drops to 160 degrees and stays low for another 20 minutes and the cycle continues. Does that make sense with a collapsed inlet hose? When your engine temps are 160F do you know what your exhaust temps are? The difference between left and right makes sense because the left side had lower water flow than the right when I pulled hoses and measured flow. Even when working properly one manifold will always read a little different than the other, so even up to a 20 degree difference between the is normal, as long as either one doesn't go over 160F. So right now you have a lack of water problem. 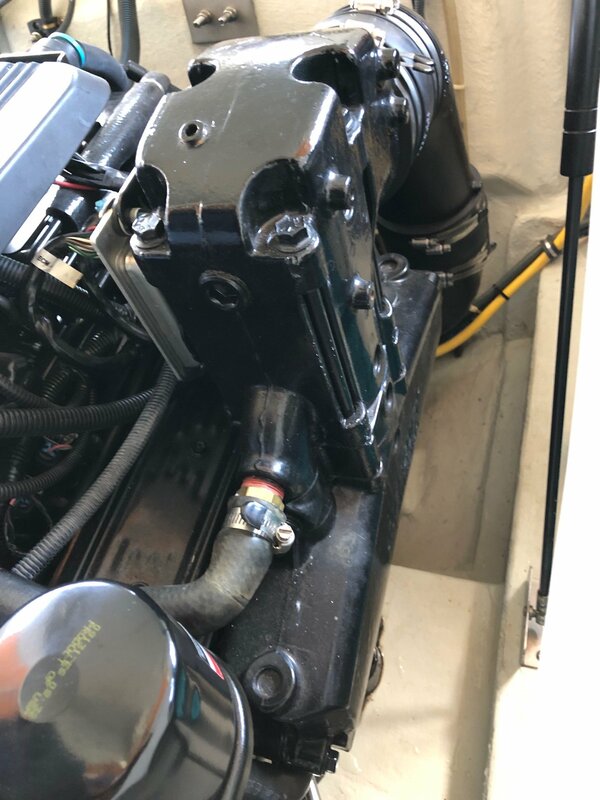 If you are confident the seawater pump itself is in good shape, with no deep scratches or groooves in the impeller housing, the next place to look is going to be that water line in the transom. Thank you, ***** ***** am happy we have narrowed it down to two options. I am not certain the impeller housing is good. Seriously considering buying the rebuild kit with stainless on both ends to address the groove issue. Comes with a shorter impeller. Here is the link. http://www.amarket.com/im496reb.htm Thoughts on this?I believe my path of least resistance now is: 1) pull the transom hose and inspect with the endoscope camera. 2) rebuild the impeller housing with the kit to address grooving. 3) pull the boat off the marina and take to the Cobalt dealer to pull the stern drive and replace the transom hose. I am open to any other suggestions you may have. This has been a puzzle. Thank you! I've never personally used it. In the shop we use OEM/Factory parts or we just don't work on the boat. Thank you, Sir. Makes sense. Thanks again for all of your help. Enjoy the weekend! You are very welcome. You have a great weekend as well. My MerCruiser 350 mag is only overheating under heavy load.